Time to Replace Old Signs? 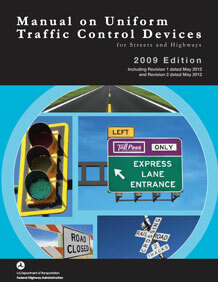 The 2009 version of the MUTCD Manual contains the most widespread changes, additions, and deletions to sign designs. The goal of the FHWA is to make signs bigger, brighter, and more understandable to all drivers including America’s aging population. Driver studies indicated a need for an emphasis on symbol signs, mixed upper and lower case copy on guide signs, as well as larger signs for ease of readability. There are upgraded minimum retro-reflectivity requirements on all signs throughout the 2009 MUTCD. Also, it is now required to implement and maintain an assessment or management method to maintain traffic sign retroreflectivity. We recommend High Intensity Prismatic on all ground mounted signs for long life, durability and compliance of new minimum retro-reflectivity requirements. Except school zones which requires fluorescent yellow green sheeting. CPC’s inventory sticker system makes inventory maintenance easy to manage with low cost, easy-to-see color coded dating stickers. There are new signs in every section of the 2009 MUTCD, as well as, many signs and sizes that are no longer an option. View the CPC Quick Guides. 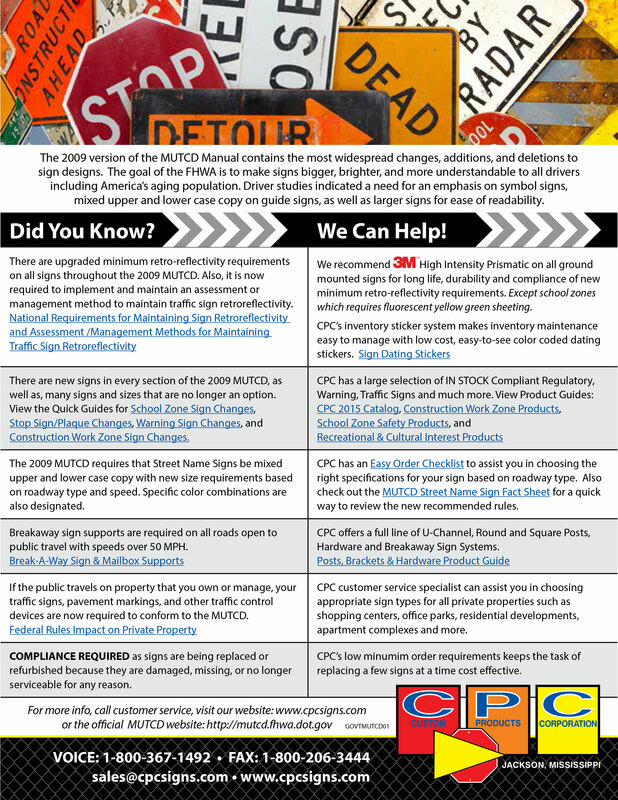 CPC has a large selection of IN STOCK Compliant Regulatory, Warning, Traffic Signs and much more. View the CPC Product Guides. The 2009 MUTCD requires that Street Name Signs be mixed upper and lower case copy with new size requirements based on roadway type and speed. Specific color combinations are also designated. 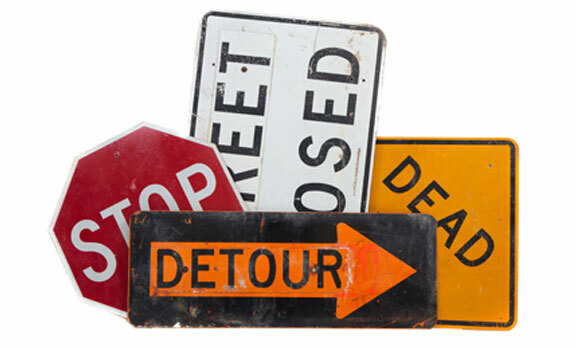 CPC has an Easy Order Checklist to assist you in choosing the right specifications for your sign based on roadway type. Also check out the MUTCD Street Name Sign Fact Sheet (at left) for a quick way to review the new recommended rules. Breakaway sign supports are required on all roads open to public travel with speeds over 50 MPH. CPC offers a full line of U-Channel, Round and Square Posts, Hardware and Breakaway Sign Systems. If the public travels on property that you own or manage, your traffic signs, pavement markings, and other traffic control devices are now required to conform to the MUTCD. CPC customer service specialist can assist you in choosing appropriate sign types for all private properties such as shopping centers, office parks, residential developments, apartment complexes and more. COMPLIANCE REQUIRED as signs are being replaced or refurbished because they are damaged, missing, or no longer serviceable for any reason. CPC’s low minumim order requirements keeps the task of replacing a few signs at a time cost effective.